I've found that my nails are weaker after I take the gel off and my friend has found the same. I asked a nail tech about this and she confirmed this. Have you found this true? 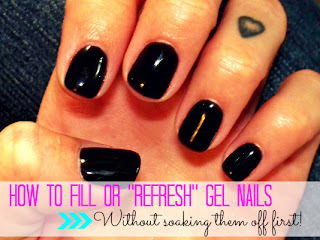 When you refresh your gel nails can you use a different color than the original or do you have to completely remove to use a different color? a) is it dangerous/bad to pick off your gel nails if they start to chip and your bored/simply don't have time to soak them off? b) can you do a tutorial on the best techniques to prep your nails for gel? c) for those of us who still think $125 dollars is a little bit too much (oh I want it, but school loans are no joke) what do you think of gel"ish" coats like Gelous at Sally's Beauty that offer a similar hard look and feel but the freedom to use colors you already have and don't need a curing light? d) what other brands have you tried so far that actually work well? 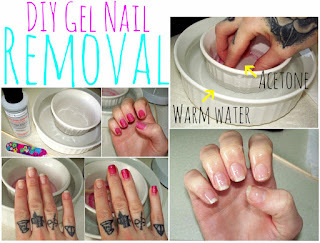 I have to say, I got hooked on gel nails around my wedding and in searching for a good at-home tutorial, yours is by far the easiest to understand and the most in-depth. I appreciate your meticulousness and I'm looking forward to the update! My nails are short and break easily from using acrylic. So I'd like to add tips to my nails, but can I apply the gel over my nails with tips? I think I tend toward oily nail beds... regular nail polish barely lasts two days on me before it's peeling up in sheets and the life of a gel manicure lasts drastically less than intended... like maybe a week before it peels. After noticing, I started making sure my nails were really dry and dehydrating them with a primer/dehydrator before starting any application (regular or gel) but it still doesn't seem to help much. I was wondering if you had any tips or thoughts on dealing with this issue. Hope I'm not too late for the FAQ. 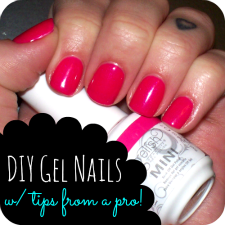 Can you use one brand of gel color with another brand's base and top coat? How come Gelish and Sally Hansen have a separate base and top coat, but the SensatioNail kit (which I have, and like a lot, and the color and shine lasts and lasts, just $50 for the starter kit at CVS!) uses the same bottle for the base coat and top coat? (Is it because the SensatioNail kit also comes with a little bottle of sticky stuff to put directly on your nail bed before applying the base coat?) What if you used regular nail polish (and let it dry naturally, of course) inbetween the base and top coats.... would the topcoat protect it? Sorry that's lots of questions.... your tutorials are fantastic! Thank you for your tutorials! My nails look great. My nail lady quit the business, so I went out and bought the whole shebang, with your help. My question is about nail art: those new nail stickers that cover the whole nail or just the french tip stickers. Can we use them with gel? I am just learning about gel nails and have started collecting products. Will both lamp styles work with any gel polish or do I have to make sure I am using LED polish with my LED lamp? Thank you! I want to get my nails done this Saturday and have been looking for nail salons that do gel nails, but I want to get UV gel nails. Is there a difference? And should I call the nail salon to ask if they do UV gel nails? I would just call and ask if they do gel or Shellac manis...they will know exactly what you're talking about! Gels cure either with UV or LED lights, and the only difference there is the amount of time it takes to cure them. The end result is the same! Maybe because the pre-polish buffing takes off a bit of the top layer? You can reduce damage by buffing only on new growth.